The desert planet Jakku has featured prominently in promos for the upcoming Star Wars flick The Force Awakens. You may not recognize the name, but you've almost certainly seen pictures of the Imperial Star Destroyer lying crashed on its surface. 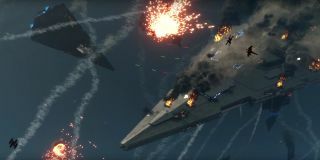 That mishap occurred during a major battle between the Empire and the Rebellion that will be replicated in Star Wars Battlefront. And thanks to this new teaser video, we know how it will look. It is, admittedly, a very brief glance, and it's not actual gameplay, but I like it anyway. One thing has me curious, though: The downed Star Destroyer that appears in The Force Awakens trailers (The Inflictor, apparently) is already on the ground. So who's this other bonehead augering in?